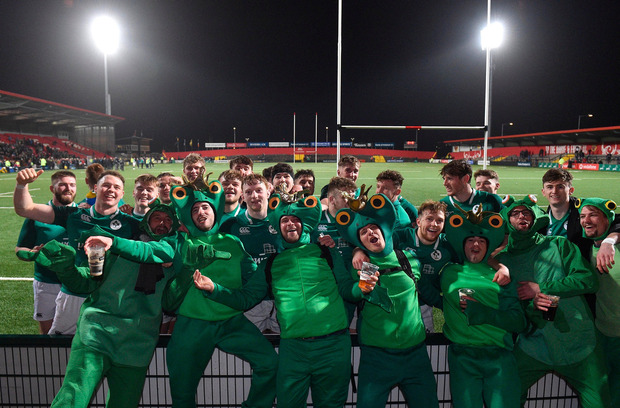 The Ireland U-20s are Six Nations champions for the first time since 2010, but more importantly the Grand Slam dream is still alive. They will travel to Wales on Friday knowing that victory would secure a first Slam in 12 years. That they have to chance to do so is down to another immense performance that saw them topple the current world champions France in front of a raucous 8,008 sold out crowd at Irish Independent Park. Having began their campaign with a stunning victory over England in Cork, Ireland have since gone from strength to strength and this was the latest evidence of a team that is littered with stars of the future. Reputations went out the window as Ireland overturned a French side, who boast several players who regularly play in the Top 14. Ireland had outstanding performers all over the pitch. Ben Healy ran the show from out-half and was helped by another electric display from Craig Casey. Sean French proved the x-factor, but the backs had their tireless pack to thank for setting the platform. Man-of-the-match Josh Wycherley scored a try in either half and was part of a front-row who really stood up to the French power. Scott Penny was everywhere with John Hodnett carrying relentlessly all evening. An early Healy penalty settled any early nerves as Ireland opened up a 3-0 lead after just four minutes, before Niall Murray did brilliantly to haul down Paul Boudehent short of the line. A scintillating French break delighted the home crowd as his dancing feet created the opening try shortly after. A sumptuous offload saw French link brilliantly with Healy as the two players who were drafted into the starting XV made an immediate impact. Ireland stayed patient in the France 22 with Wycherley powering over from close range for a fine score. Healy's conversion stretched the lead to 10-0 and that sparked Les Bleus into life. Louis Carbonel was one of France's key men in last year's World Cup and as the Toulon out-half grew in confidence, so too did his team-mates. The game was still only 15 minutes old when Jean-Baptiste Gros, another player back from last year, collected Joesph's offload and dotted down. Carbonel added the extras and did so again 11 minutes later when he scored a really-worked try of his own. Suddenly Ireland trailied for the first time, but to their credit, they stuck to the task and Healy fired over a penalty from 40-metres to leave the score at 14-13 as we moved towards half time. Ireland might well have went into the break in front as another searing French break had the French defence scrambling, only this time they couldn't take advantage of it. As it was however, Noel McNamara's charges only had to wait six minutes of the second half to retake the lead with Healy's penalty good enough for a 16-14 lead. France though hit back immediately via a Carbonel penalty. Ryan Baird was on the pitch a matter of seconds before he made his presence felt with a powerful carry. Healy then punished France's indiscipline for a 19-17 advantage. Ireland sensed blood and they upped the tempo. Baird was again central to their third try with another huge carry. Patience was again key and as the green wave pounded away at the blue wall, the pressure eventually told as Wycherley burrowed over for his second score of the night. Healy made no mistake with the conversion to open up a nine-point gap (26-17). Carbonel hauled France back into the contest when he ran clear from inside his own half for his second try. But back came Ireland again. This time it was Healy's break that created the spark. Casey did well to recycle the ball and while he injured himself in the process, he set the platform for Callum Reid to crash over for a third try. There was barely time for anyone to catch their breath as Ireland led 31-22 with 12 minutes left on the clock. France ensured that it was a nervy finish but Maxence Lemardelet's late converted try was too little too late as Ireland clinched the title and set up a shot at history in Wales. Ireland U-20s - J Flannery (R Russell 66-73); A Kernohan (Russell 73), L Turner, S French, J Wren; B Healy, C Casey (C Foley 69) J Wycherley (C Reid 39-h-t, 66)), D Tierney-Martin (J McKee 66), T Clarkson; C Ryan (capt), N Murray (R Baird 52); M Moloney, S Penny, J Hodnett. France U-20s - A De Nardi; V Pinto, A Vincent (capt), S Delbouis (M Smaili 66), M Lebel; L Carbonel, Q Delord (K Viallard 75); J-P Gros (E Eglaine 55), R Barka (L Zarantonello 66), A Burin (G Beria 55); G Maravat, F Vanverberghe (A Warion 66); P Boudehent ( M Lemardelet 46), S Zegueur, J Joseph.